That clerks cannot provide legal advice in Illinois is prominently stated in many documents and on many websites. Illinois Legal Aid Online notes that "Clerks, judges, and other court employees cannot give you legal advice or tell you what you should do in your case. There may be a help desk available at the court where you can get some advice." The "Illinois Supreme Court Policy On Assistance to Court Patrons by Circuit Clerks, Court Staff, Law Librarians, and Court Volunteers" states: "Prohibited Services. Circuit clerks, court staff, law librarians, and court volunteers—acting in a non-lawyer capacity on behalf of the court—shall not: …. Provide legal analysis, strategy or advice to a court patron, or perform legal research other than assistance in self-guided legal research for any court patron; …" As a final example, the Rock Island County Circuit Court, Clerk's Office, states prominently on its website: "NOTE: WE ARE NOT ATTORNEYS AND CANNOT GIVE LEGAL ADVICE." 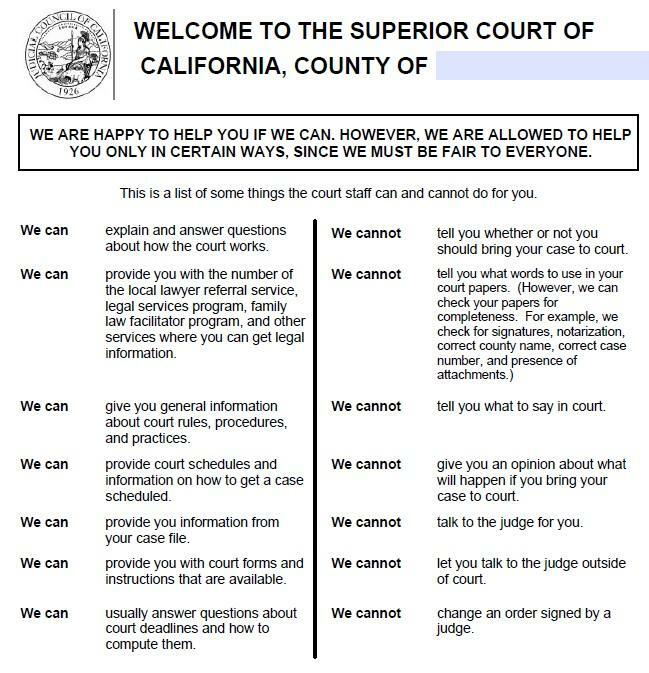 The Judicial Council of California has addressed this issue in much more detail with a brochure and form called "MC-800, Court Clerk's Office: Signage" that allows court clerks to offer specified assistance to court users. There is an explanatory brochure that goes with it, "May I help you? Legal Advice vs. Legal Information" (2003 by Judicial Council of California/Administrative Office of the Courts). Mr. William Blanchard concludes that while the California signage and brochure clarifies the clerks' duties, it does not help pro se litigants in need of legal help. Also, the California approach does not lessen the burden on the court system. It is unlikely that pro se litigants will read the brochure "May I help you?" before asking a court clerk for help. This issue will continue, possibly forever. Legal self-help centers (as already exist in Illinois in some instances), flexible payment plans offered by attorneys, and allowing paralegal professionals to provide limited representation (as proposed in some other States) may provide relief. *** Mr. William B. Blanchard ("Bill Blanchard") is a real estate attorney with offices in Illinois. Bill specializes in representing real estate clients for purchases and sales as well as home owner real estate tax assessment appeals.